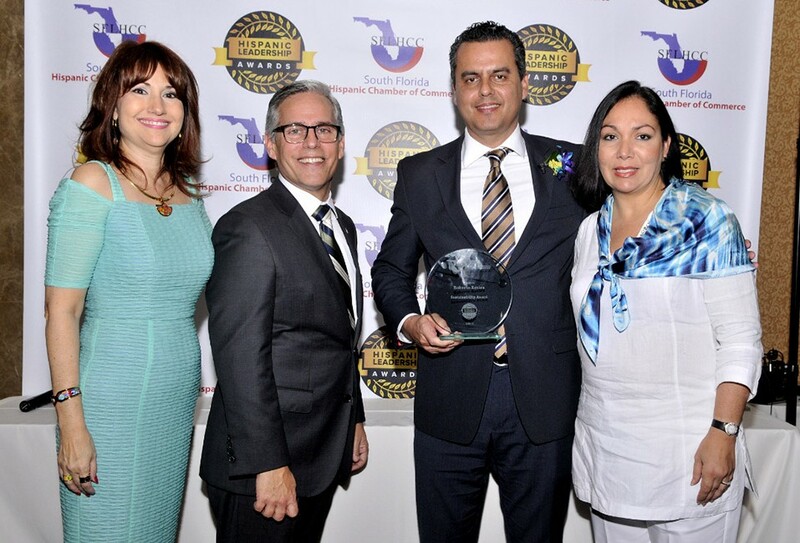 Roberto Rovira received the Hispanic Leadership Award from the South Florida Hispanic Chamber of Commerce on Friday, 20MAR2015. The Hispanic Leadership Awards is celebrated annually in the month of March. It is a signature event of the South Florida Hispanic Chamber and recognizes individuals that provide excellence in different fields within the Hispanic market of South Florida. These individuals, companies and organizations have worked and volunteered within their community to help improve and make our city a better place to live, work and play. Roberto received the Hispanic Leadership Award in Sustainability. From left to right: Liliam M. Lopez, President/CEO SFLHCC; Felipe F. Basulto, Chairman SFLHCC , Retail Market Manager – Miami Dade, TD Bank; Roberto Rovira; and my wife, Lola Bellaflores, my most dedicated, passionate and supportive advocate.